A cold front brought slightly cooler temperatures to Winnipeg on Sunday, but more mild spring weather is on the way this week. Temperatures are on their way back up as warmer Pacific air spreads eastwards across the Prairies again. The Red River Valley, though, will still be under the influence of a departing Arctic ridge. This will give Winnipeg a near-seasonal high of +1°C with sunny skies. Winds will be light, making for a pleasant spring day all around. A warm front will push into the region tonight, bringing cloudier skies as temperatures dip to a low near -6°C. Winnipeg will see mostly cloudy skies on Tuesday as the warm front pushes through. There may be a brief morning snow flurry, but the rest of the day looks dry. The wind will be a bit of a bother out of the south at 30 to 40 km/h for much of the day. Winnipeg should see temperatures rise to a high near 5°C. Skies will stay cloudy on Tuesday night as the winds ease and temperatures dip to a low near 0°C. Wednesday will bring what will likely be the warmest temperatures of the week to Winnipeg. A low pressure system is forecast to track across the Province, drawing even milder air into the Red River Valley. The wind will shift west-northwesterly in the afternoon, breaking up the clouds. With a bit of sunshine, Winnipeg should see temperatures climb to a high near 7°C. A weak cold front is forecast to push through on Wednesday evening, bringing more cloud and slightly cooler temperatures. The rest of the week looks to bring light to moderate northwesterly winds with variable cloudiness. High temperatures will likely hover in the mid-single digits with overnight lows dipping below freezing. No significant precipitation is in the forecast. 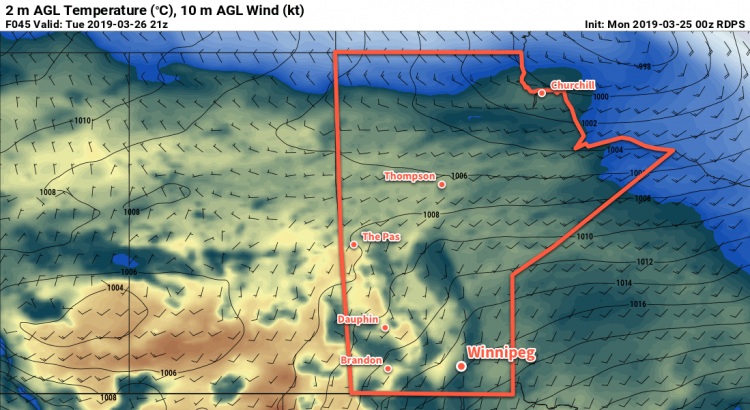 For the weekend, early indications are that Winnipeg will see increasing cloudiness and another push of warmer weather! Today’s seasonal daytime high in Winnipeg is +2°C while the seasonal overnight low is -8°C.